Manufactured from satin-black powder coated stainless steel, they blend in nicely with the instrument panel. 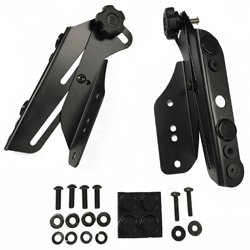 All hardware is included along with an Allen key to remove the factory bracket and install the Mad Stad - all you need is a Philips screwdriver and 5-10 minutes for installation. !screens, robobracket, robobrackets, robo, vstrom, 14, 15, 16, 2014, 2015, 2016, vstrom, dl, 1000!